Last year was filled with complexity, contentiousness, and change. Sometimes, it was for the betterment and progression of society, and other times it happened in ways that dragged efforts backwards -- but little of it occurred without most people gaining and revealing some battle scars along the way. 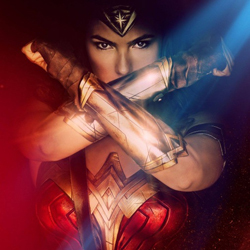 As is frequently the case, the movies released in 2017 provided an echo for the sentiments laced throughout the news cycle, but one element in particular stood out in tremendous fashion in this year’s batch of movies: stories about and hinged on women, both overt representations and subtler, more subversive efforts, reigned supreme. 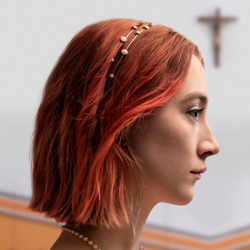 The latest exceptional films from pop-culture auteurs Christopher Nolan and Edgar Wright struggled to keep up with Greta Gerwig’s spin on adolescence, Guillermo del Toro’s endearingly warped love story, and Martin McDonagh’s harrowing, yet shrewdly humorous tale of a grief-stricken mother fighting for her daughter’s justice. Amid all this, comedian Jordan Peele also dropped one hell of a meaningful, tongue-in-cheek psychological thriller into the mix. 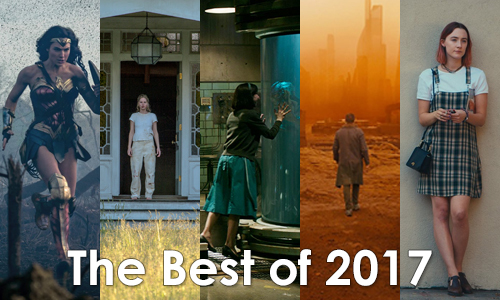 Science-fiction and horror genre delights blended with clever spins on contemporary society and historical depictions in a decidedly outstanding year for film. Below, you’ll find ten favorites -- and a few honorable mentions -- that I'll be taking away from 2017, kept in alphabetical order to avoid arbitrary ranking. A synergy of music, color, and attitude fuel the chaotic works of Edgar Wright, from spoofs of the zombie apocalypse and buddy-cop action films to a boy’s videogame-inspired journey to defeat ex-boyfriends in order to win his almost-girlfriend’s heart. 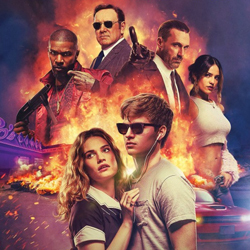 Each one has enough satirical or exaggerated tonality to stay at a distance from realism, and that’s the line that Wright's crime drama Baby Driver crosses with sophistication and gusto, driven by an earnest story of young kid who’s caught up in organized crime and trying to make his way out and rediscover happiness. 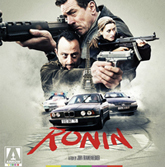 The premise possesses Wright’s signature flourishes, giving the driver Baby (Ansel Elgort) a ringing in his ears that he drowns out with a precise arrangement of tunes by the director, but his melancholy indebtment to Kevin Spacey’s crime boss and his shy pursuit of the lovely Debora (Lily James) steer the director’s film into a more earnest lane. Wright’s strategically vivacious combination of music and editing still fuels the affair, but those tweaks in his intentions give the breakneck pacing of the storytelling and action a boost throughout. Penniless journalist and borderline alcoholic Gloria (Anne Hathaway) decides to pack her bags and head back to her hometown after coming face-to-face with her problems … though, really, she didn’t have much of a choice in the matter. There, she reconnects with old friends, including bar owner Oscar (Jason Sudeikis), and picks up a job while she’s getting back on track and attempting to detox. 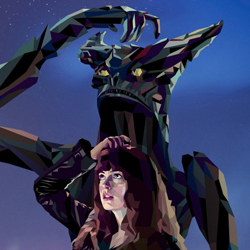 What sounds like any other inspirational drama takes a clever turn in Colossal when Gloria discovers, through a stroke of magic, that she sporadically gains control of a kaiju-style, skyscraper-tall monster that rampages through South Korea, giving her something of a wakeup call within her current state of self-focus and passivity while getting her life straightened out. Themes of substance abuse, jealousy, and regret over life choices give Nacho Vigalondo’s film a darker and more pensive streak than what some might expect from the concept, elevated by a versatile performance from Anne Hathaway that employs both moments of her overstated comedy and raw, soul-searching dramatic presence in how Gloria crashes into her many issues. There’s typically some kind of a narrative hook within each installment into Christopher Nolan’s body of work, so curiosity naturally arises over how he’s done so with Dunkirk, his tense depiction of “Operation Dynamo”, an evacuation of allied soldiers trapped on beaches in France during World War II. 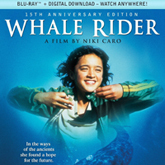 The answer comes, unsurprisingly, in the narrative structure of the film, in which Nolan breaks the chronology of stories into three segments -- one that takes place across a week, one that takes place across a day, and one that takes place across an hour – that eventually converge amid the dramatic evacuation itself. 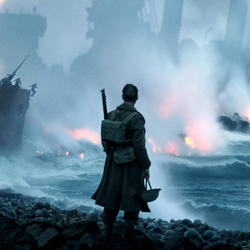 Crafted with tight thrills in mind, resulting in the second shortest runtime of Nolan’s feature-length career, Dunkirk never wastes a moment in how it depicts the tenacity of the soldiers and their paranoia over the enemy’s proximity, guiding numerous characters with defined purposes through the chaos. A carefully-constructed message of patriotism and camaraderie among a country’s citizens amounts to a dazzling historical thriller, heralded for balancing historical accuracy and cinematic embellishment. Who knows what it is about comedy-minded directors that also makes them perceptive of the unsettling corners of suspense -- from Bob Clark’s Black Christmas earlier in his career to Rob Reiner’s Misery and John Landis’ An American Werewolf in London -- but perhaps it has to do with the warped, oftentimes dark nature of comedy itself. 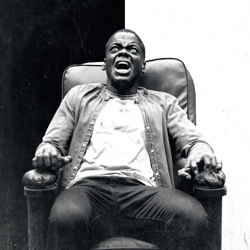 Jordan Peele joins those ranks in grand fashion with Get Out, which has taken on a strange categorization since its release, mostly due to the efforts put in place for award recognition. There’s a satirical intention to Peele’s story of a black photojournalist who, while on a trip with his girlfriend to meet her parents, discovers a community of older white people exerting a form of mind control over other black people, so they’ll conform to their social standards. Comedy this isn’t, though, as Peele unleashes unsettling psychological thrills upon the audience packing a fierce symbolic punch that accomplishes more than mere satire, instead joining the ranks of other pieces of science-fiction that utilizes its premise as a microscope focused upon legitimate societal concerns. 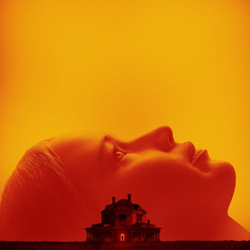 Darren Aronofsky has crafted his most complex and metaphorical work to date with mother!, a depiction of a couple’s relationship dynamics as they renovate a home, cater to guests, and embrace the wonders of pregnancy. Jennifer Lawrence turns in a deliberately doe-eyed, obedient performance that simmers with frustration throughout, eventually reaching a boiling point as her patience with her guests -- Ed Harris and Michelle Pfeiffer, imposing themselves brilliantly upon her “nest” -- begins to wear on both her day-to-day activities and her renowned author husband’s progress on his book. On the surface, the domestic thrills built around Lawrence’s expecting character are effectively claustrophobic and button-pushing, yet very little of Aronofsky’s film exists without underlying meaning. 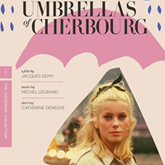 What begins as domestic suspense with a slightly off attitude descends into an allegorical depiction of the pillars of nature, religion, and expectations placed on women by society, which one can be selective in how to interpret it all as mother! 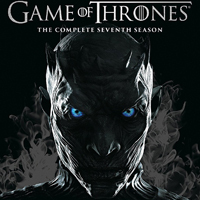 is brought to disturbing, boldly suggestive ends with a brazenly surreal finale. 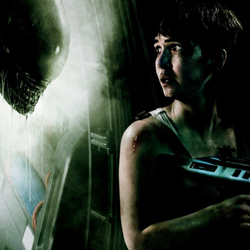 Much of Guillermo del Toro’s work fits into the category of genre entertainment, from soldiers manning giant mecha-suits that hold off monsters to vampire action films and gothic ghost yarns. When he reaches deeper into dramatic complexity, such as with The Devil’s Backbone and Pan’s Labyrinth -- both still borderline genre films, both in Spanish -- del Toro elevates the richness of his characters and thematic intricacy of his intentions that oftentimes go unnoticed. 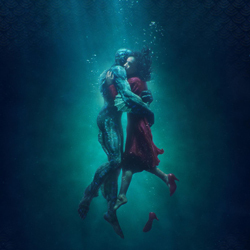 These are the pieces of work that his devotees truly anticipate, and he’s delivered another with The Shape of Water, though this time he’s stricken those chords in an English-language film. 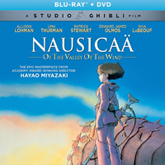 Absorbing shot and dazzlingly scored by Alexandre Desplat, del Toro’s tale of a deaf and mute cleaner who befriends a humanoid aquatic creature at a government-run facility revolves around transcending the boundaries of normal communication, along with discovering love and compassion under those circumstances. Sally Hawkins’ intuitive and emotive performance is marvelous at underscoring this complicated tenderness. 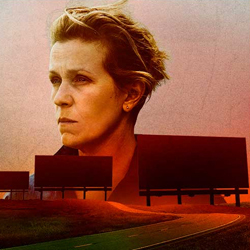 Out of frustration with the local police department over their investigation of the violent abuse and murder of her young daughter, divorced gift-shop worker Mildred (Frances McDormand) purchases the advertising rights for a trio of billboards in the city’s outskirts. There, with vivid red backgrounds and black lettering, she makes her message heard loud and clear, upsetting both the police chief (Woody Harrelson) and the townsfolk to such a degree that she’s pressured into taking the signage down. With McDormand playing the bluntly determined and ferocious mother, her resistance to their efforts grasps onto some of the darkest humor out there, while also drudging up hard questions about revenge for investigative complacency, respecting police authority, and the moving parts of sexual assault in rural America. McDormand’s portrayal as Mildred is crucial to Three Billboards Outside Ebbing, Missouri, yet she’s counterbalanced by the wounded charm of Woody Harrelson and, particularly, the hostility and awakening of Sam Rockwell’s wannabe detective Dixon in this incredibly tense pitch-black comedy. Despite the additions of “brotherhood” assistants to the main character, intense boat-to-boat naval battles, and even dual protagonists, the Assassin’s Creed franchise has largely stuck to the same formula that’s worked for it since the original landed on the scene roughly a decade ago. 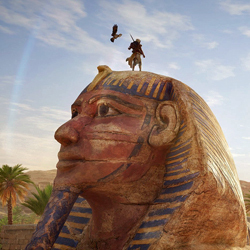 Sensing it was time for something new after the past couple of installments didn’t exactly make waves, Ubisoft decided to combine one of the locations players have most requested for the franchise to take place in, Egypt, with an overhaul -- and stripping down -- of the game’s mechanics with Assassin’s Creed Origins. Naturally, aerial assassinations, wall-climbing, and other elements of stealth movement return through the vantage point of Bayek, one of the last remaining Medjay protectors of the land coping with the death of his son. The open-world aspects, combat, and storytelling style have drawn influence from other franchises -- The Witcher and Batman Arkham series -- and molded them to ancient Egypt’s antiquated environment and tools at the character’s disposal, diving into truly renovated and rewarding territory for Assassin’s Creed. 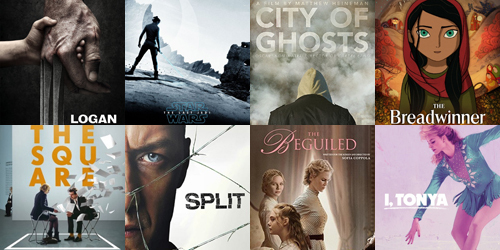 Lots of love for the cinema of 2017 in what’s been a tumultuous year on a meta level, where the volatility of what’s going on in current events translates, in a way, to the unpredictable strengths that emerged in these tales of empowerment and social issues, taking shape through a unique mixture of grounded and elevated-reality fiction. 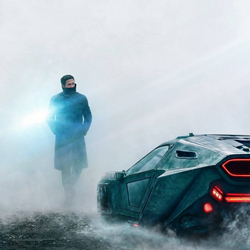 The sci-fi lover in me cannot help but be disappointed in Blade Runner 2049’s inability to catch on with a wider audience -- and with Ridley Scott’s more direct return to the Alien franchise -- but beyond that, there are tons of exceptional works released this year that also actually have substantial return value, both in terms of entertainment value and for magnetic craftsmanship. It’ll be hard for 2018 to measure up, but let’s hope it defies the odds so that there’s just as many confident critiques and quality escapes from the world’s unstable day-to-day rhythm. Thanks for reading, y’all, and all the best for the coming year.